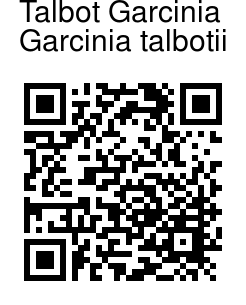 Talbot Garcinia is a tree up to 20 m tall. Bark is yellowish or brown, blaze cream. Branchlets are angular, hairless, sometimes with minute hairs. Latex is cream colored, profuse. Oppositely arranged leaves are decussate. Leaf-stalk is 0.6-2.1 cm long. Leaves are 7-15 x 3-7.5 cm, elliptic to narrow elliptic or narrow ovate, tip usually rounded sometimes pointed, base rounded or slightly chopped, margin revolute, leathery. Secondary nerves are nearly parallel, and looped near margin. Flowers are dioecious - male and female flowers in axillary clusters on short peduncle. Berry is round, 5 cm across, 1-4 seeded. 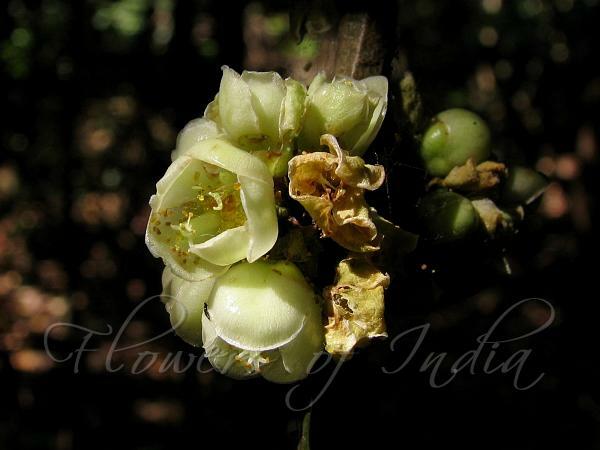 Talbot Garcinia is endemic to the Western Ghats, South, Central and south Maharashtra Sahyadris.